If you have a business or quality product in which you feel would benefit the women who visit my blog, I am interested in working with you. Our growing readers are mostly busy homeschool Christian women who are looking for resources on the following topics: homemaking, homeschooling, organizing, frugal tips, easy recipes, and spiritual encouragement. Sponsored eBlast – I have different options available at this time. Limited 3 Day FREEbie Promotion – I do not charge a fee for this service, but I do require the freebie must be at least 10.00 or more retail value. 350×250 ad: Will be placed on my sidebar below the fold. Also, I will promote any specials you have on my facebook page one time per special. Reviews and Giveaways: My readers look forward to giveaways on my platform. Giveaways are a great way to get the word out about your products. At this time, I am only posting limited reviews . However, if you would like to offer my readers a giveaway , I would be glad to discuss this option with you. I do not charge for giveaways, but do require a value of a 100.00 minimum worth of products for the raffle. This can include multiple numbers of a single product. Guest Post (Business): If you are interested in writing your own informative post or advertisement, you are more than welcome to include your social media and use your logos and images. Guest Post (Personal): If you’re a blogger who has wisdom on any topics related to my niche, please contact me and I will be glad to send you my Guest Post Guidelines. Please Note: If I try a product and it is not a good fit for my family, I reserve the right to refuse posting a review. 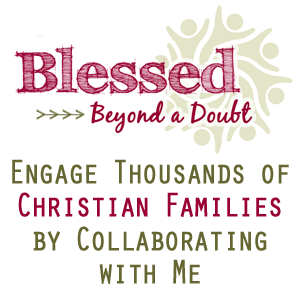 Thank you for your interest in promoting on Blessed Beyond a Doubt. If your company is ready to grow and have the opportunity to be seen by thousands, please contact me today for my current media kit and fee rates. I would love to receive your guidelines for guest posts. 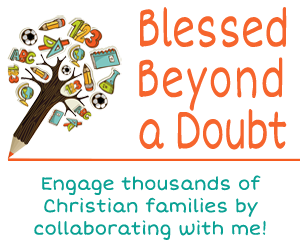 I have a non-profit Christian devotional blog. I’m a grandmother and former homeschool mom. Jill, in your About Me bio it says “a helpmeet to my soul mate” did you mean helpmate or is that a work I’m just not familiar with? your site is nicely done and I hope it continues to grow. Hey Dayton, I saw your question and decided to answer. The bible says “helpmeet” and not helpmate.